Bill Hanson is a graduate of American University with a B.F.A. in Studio Painting. As an illustrator, he has worked for major publishing houses (Simon and Schuster, Signet, Dell, and E.P.Dutton) and several magazines. His portrait work has included a Chief Justice of the Connecticut Supreme Court, corporate executives, and a series of portraits of past winners of the Masters Tournament in Augusta, Georgia for Golf Digest. Many of his commissioned portraits can be found in international collections. In current years, his love of the sea and its lore has also influenced his choice of subject matter. 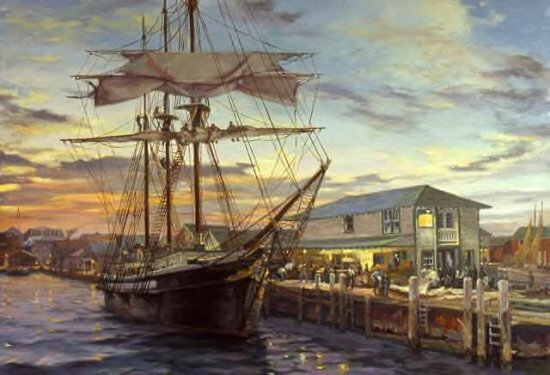 Bill is a signature artist member of the American Society of Marine Artists (ASMA), a member of the New England Plein Air Painters, an artist member of the North Shore Arts Association, and was recently voted an elected artist of the Lyme Art Association. When not in his studio, he can be found on the back roads of the northeast or painting and sketching the coastline, countryside and people of the Atlantic shore. You can contact the artist at: wghansonart@sbcglobal.net.